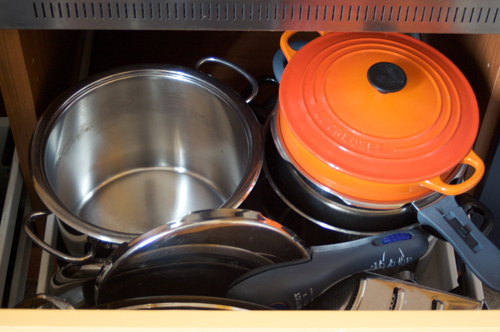 10 steps to (better) cooking: Gear up! If you want to drive a car you need an engine. If you want to hike a mountain, you need the right shoes and equipment. If you want to bike, you need a working bicycle. But if you want to to cook most people is convinced you don’t need anything if not a few pan. That is not true! Especially if you are not a trained chef, you need much more, at least to speed things up. 1 stand mixer, with all the good attachments, like cutter, grater, whisk… It will save you so much time! Do not buy cheap pans, appliances or knives! Cooking with a good quality pan and cutting with a good knife will save you time and give you much more pleasure then cooking with a low qaulity pan where everything sticks and cutting yourselves along with the onion! Believe me when I say that a very heavy griddle is much better than a light on: it will substitute the BBQ during winter, cooking everything perfectly! For the home appliance, do not go for anything with less than 700kw of power, even the hand mixer: you’ll see the difference!